Dedicated fingerprint sensors may be nearing extinction. 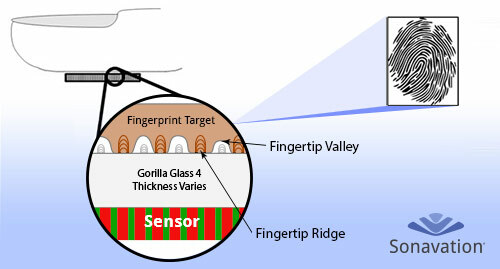 Today, Sonavation announced technology that puts ultrasonic biometric sensors under Gorilla Glass that can be used to read fingerprints. The technology includes manufacturing and bonding the sensors directly to the display material. Currently, Sonavation is only announcing compatibility with Corning Gorilla Glass; likely not a problem unless Apple can manufacture Sapphire glass on a large scale for use in iPhones. Though details on how it will work are sparse, Sonavation says its sensors are “capable of capturing fingerprint data into the ridges and valleys.” It also says 3D scanning can take place if a finger is wet, dirty or oily — all without compromising accuracy. Of course, this is just an announcement of a cool new technology. There’s still no word on when we might see it on our phones and tablets, but the clock is ticking for home buttons and dedicated sensors.